The multi-stage participants of the 2nd West Coast 200Km assemble for a group picture (from left to right): Carlito, Edwin, Race Director Jovie Narcise, Me, Bong, Ruben V, Merwin and Ruben H.
BOOKENDED holidays have become commonplace in the last few years – quite a treat for students and slackers, and for endurance junkies who crave additional training and/or racing days – but obvious productivity killers for companies looking for some momentum. I suppose there’s some pretzel logic in declaring special holidays that give the working class a rest, the retail and tourism industry a boost, and netizens even more time to stream/surf/chat without fear of retribution. Extended weekends are ideal for races that require more preparation or time to conduct or complete. 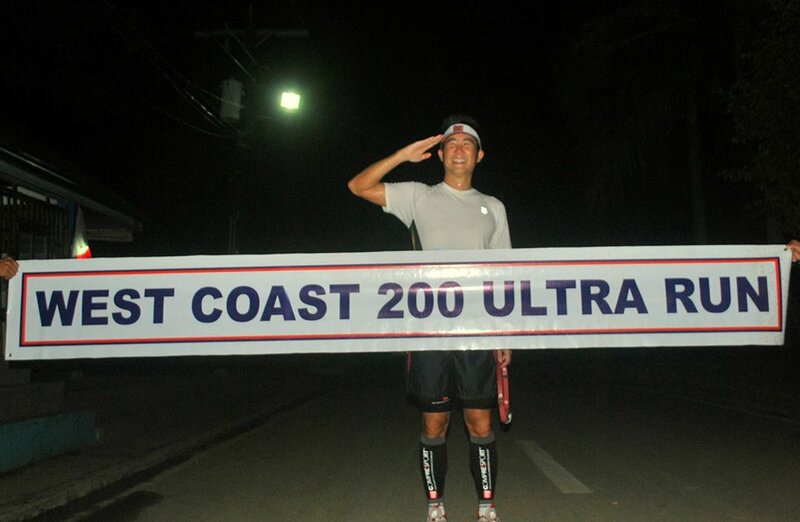 I decided to join the second West Coast 200km Ultra Marathon (WC 200, for short), after completing the Bataan Death March 160km Ultra Marathon in January early this year. A few friends had joined the previous year’s multi-stage race, and the stories they shared were enough to convince me to hit the road, which spreads the 200-kilometer course over three days; each day with a different cut-off time, and a total cut-off time of 36 hours. This year’s edition of the WC 200 would feature an additional format, the single-stage race, with the same starting date and time as the existing multi-stage race. The single-stage calls for a continuous start-to-finish run with a cut-off of 48 hours. With a race calendar that hasn’t let up, the challenge lay in physically preparing for a distance that was unlike any I had ever done, but one that I was mentally prepared to do. Okay, one of two wasn’t so bad when I thought about it; and since my training program included weekends comprised of a long ride (120-140 km) on a Saturday followed by a long run (50-60 km) the following day, I had to admit that was preparation enough. Still, there was THE distance to cover come race day. In the end, my longest run (technically, it wasn’t a run, since I utilized a run-walk strategy that I planned to employ for all three race days) was 50 kilometers done on a hot and humid Sunday morning in October. I felt fine throughout that long slow distance (LSD, to running folk) and practiced my nutrition/hydration plan to make sure I would sustain my energy levels throughout the duration of each run day. With a 5 a.m. gun start, there was little chance I was going to get any sleep if I was making the trip from Manila to Subic; so I decided on a relaxed dinner at home with the family and watched some television while waiting for midnight. Two light snacks before leaving and upon reaching Subic, and I was filled, chilled, and ready to toe the start line for another amazing road journey. What surprised me the most at the beginning of the race was the number of single-stage entrants: there were 44 brave souls who signed up. In sharp contrast, only eight, myself included, were listed for the multi-stage run. Apparently, the number of deranged ultra-runners had grown considerably and this inequitable ratio between single-stagers and multi-stagers was a clear indication. Some of my friends doing the single stage were even trying to convince me to ‘upgrade’ and join them, justifying their choice as less painful since it will be one, continuous expedition into agony instead of three, when compared to the multi-stage. At gun start, the herd made two loops around the Remy track oval and proceeded onto the road leading to the exit gate. From there, we followed a gradual climb up the still-dark road leading into town, running against an oncoming traffic of trucks, tricycles, and assorted passenger vehicles with our trusty support vehicles leap-frogging us to agreed points/distances ahead. Daylight began to break just as I reached the bottom of the rolling route, as the rapidly illuminating sky bathed me with more confidence to pick up my pace. Stay with the (run-walk) plan, I had to remind myself, each time I got passed by a fellow runner during the walk portion of the interval. The temptation to run and not give up the lead was never a factor when I was training — but, of course, since there was no one else running with me. I had/have always viewed this attitude (of not giving up the lead) as ‘more of a guy thing.’ From my personal observation during fun runs, triathlons, duathlons, and marathons, male competitors do not savor the idea of being passed (at least at the beginning of a race) by: a) females; b) fat people; and c) old(er) people. I wasn’t about to fall into this mindset. I had fallen for it in the early years of active competition, until I realized that just trying to keep up with Sheila, Tubby, or Grandpa Moses did nothing but wear me out or make me look really stupid – often, both. Everything went well, and though I began to experience a little fatigue past Km 50, my spirits were buoyed by the smiles and waves of the friendly town folk, and the urging of the other runners who passed me or whom I passed. At around Km 55, a small support team from the local government handed me an energy drink and a banana, which I gratefully accepted. While engaging them in small talk about the weather, one of the team mentioned that I was probably the sixth overall runner who had reached their station. Sixth, I asked in a skeptical tone, totally unaware of my place in the standings. Yes, came the reply, we didn’t count any more than five since you arrived. Talk about morale boosters. Learning that I was even among the top 10 that day would have been reward enough, but this was over the top. And I most certainly did not expect it. I ran-walked with more lightness in my step and strangely, with more ease. My standing would not change anything, and I didn’t bother to ever look behind me to see if anyone was catching up. I ran-walked until I reached the municipal arch of Botolan, just as a gentle rain began to fall (which developed into a heavy downpour as my support team and I rode off in search of our quarters for the night). 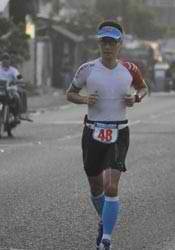 The race director greeted me with a handshake and recommended I get out of the rain soonest for rest and recovery. My team of two (Jilbert and Rey) and I found a modest hotel five kilometers away, which featured a three story walk up to reach the reception area, perfect for ultra marathoners who had just run more hours than a normal workday. After a quick check-in at around four in the afternoon, we drove to the nearest fast food place for our first solid meal for the day. We had dinner at yet another quick service joint three hours later and retired for the night, as we would be up roughly eight hours later for another 5 a.m. gun start. Waking at half past three from a surprisingly restful sleep, there was more than enough time to do a bit of stretching and loosening up in between bites of my take home siopao and sips of my 3-in-1 coffee. Big breakfasts before runs never work for me, and for another 70 km of running, I chose to ‘eat as needed’ since this has always been my nutrition strategy. We got to the start area to find the other participants sitting around engaged in casual conversation. After taking a seat on the curb and snacking on a couple of pieces of freshly baked pan de sal, I learned that the lone female runner, Jean, would not be joining the rest of us due to an ankle injury sustained the day before. We were down to seven, and with that feeble number of participants, it made sense (to me, at least) to acquaint myself with everyone with whom I would share the same road. After a short briefing by the race director and a couple of photos, we began our second leg running single file towards a crisp and cool Saturday morning that promised more adventure and surprise than the day before. So aside from feeling the urge to go every half hour and expelling nothing more than a trickle, the sensation of having my right foot perpetually pinched in a vise with every other step made the rest of the run sheer torture. This second day also brought changes in the weather that went from breezy to sweltering, and shifting from a cloudless, scorching day to one heavy drencher. By the time I tinkled on the side of the road for the nth time, my urine was coffee-colored and this pushed me to reassess my hydration strategy. Together with Jilbert who diligently took notes on my hydration and nutrition throughout the run, I had judiciously monitored my hydration, making sure that I had generous sips of water, buko, and energy drink every 1.5 to 2 kilometers – so I couldn’t be dehydrated. I wasn’t at all dizzy or disoriented, even under the extreme heat that accompanied me most of the way. Instead of mulling over a change in strategy and telling anyone (including my support, who was in constant contact with the missus via text messaging) about my java-tinted discharge, I remained focused on getting through to the finish despite this minor distraction. The pain in my right foot continued to hound me and I took more than the planned walking rest breaks in between runs, hoping to ease the pressure on my aching arch. I had lost quite a lot of time with the extended breaks and decided to try something else: make a run for it. I picked up my feet and ran at a faster clip, ignoring the invisible metal jaws that clamped hard on either side of my right foot. I managed to pass two fellow participants, and kept my pace until I felt I had put in enough time to compensate for all the walking that came before. But the unrelenting twinge kept up the pressure and my run ground to a halt as I reached a town center undergoing major roadwork. Here, I pulled to the side and sat myself on a store bench, removed my shoes, and massaged my sore arch, wishing I had the magical hands of a reflexologist who might have the means to alleviate this nagging pain. By the time I tried to have a wee again, there came a better flow, but this time with a red tinge. Whoa! I am definitely not telling anyone about this. Yet. Let me survive this and I’ll have a good story to tell. My mind insisted that something wasn’t consistent with my conventional knowledge of dehydration, so I kept on. I did take more fluids with each swig of my water bottles, but that was about it. The road still looked straight to me, and I didn’t feel like I was running on clouds, although I wish I did. My next pee stop half an hour later couldn’t have made me happier: An extended, steady, and clear stream of fluid that could probably fool anyone into drinking it, had I discharged it into a plastic bottle of mineral water. That development perked me up, and left me lighter by a few ounces, as I pushed forward with just the aching arch of my right foot and blisters on both feet to contend with. One important lesson I learned during this second leg: Never ask for directions involving distance. Sure, you can ask about the nearest gas station or where the police outpost is, since that’s a basic ‘go left at the first corner then turn right when you reach the end of the street’ kind of response that you’re bound to get. But under no circumstance should you ever ask how far they are. I learned that people have such disparate perceptions of distance that one man’s inch is another man’s kilometer. And I learned never to ask this when you think you’re near your destination. The previous day’s experience should have clued me in already – I had asked a couple of people along the course how far the municipal center (read: the finish) was, and the estimates they provided got me believing that I would get to there by the time I finished crooning My Way. Little did I know that I would have to sing all the versions of the song before I reached the arc of the municipal building. Battered and nearly broken by the agony of the feet, I knew the end of this run day would leave me ruminating whether or not I would survive the third day. Since I chose to bear the plantar pain fest through most of the run, the payback came swiftly when I crossed the finish and got into the support vehicle. My feet and legs were so banged up, I was supremely tempted to actually take a pain killer. Worse, we still had to find a place to stay, and it took us close to an hour to find the only decent hotel for miles. By the time I settled into my room and had taken a cold shower (no hot water here, folks), I seriously considered the possibility of dropping out of the next day’s race if I couldn’t repair myself in time. Even walking up and down the two flights of steps from the lobby to my room was agonizing. Of course, that bloody urine episode couldn’t be ignored so I did the most sensible thing anyone would have done: I Googled the damn thing. Hematuria. That’s the medical term for my scarlet seeping. The Mayo Clinic reference page I pulled up cites strenuous exercise as a possible cause, and proposes ‘It’s not quite clear why exercise causes gross hematuria. It may be trauma to the bladder, dehydration or the breakdown of red blood cells that occurs with sustained aerobic exercise. Runners are most often affected, although almost any athlete can develop visible urinary bleeding after an intense workout.’ It also listed urinary tract infection, kidney disease, and cancer as other causes. Just my luck. But I was over that adventure, and had to focus on the task at hand: rest, repair, recover, and run again. I had take out barbeque chicken with extra rice for dinner, which seemed to disappear in seconds the moment I plopped down on my bed to eat. What followed was a series of hot compress treatment for my blisters, gliding my foot on the foot roller for my plantar, and intimate quad and hamstring crushing passes over the foam roller. This sequence went on for a while; at least until I felt my dinner was halfway through my digestive tract. Then it was lights out, and the utmost wish that the next day would bring better things, like a brand new pair of legs and feet. I awoke to the sound of my neighbors/co-participants bantering on the porch just outside our second floor corridor. They sounded like they were in much better shape than I was. My legs were better rested, but my feet still hurt, though not as much. Propping them up on the foam roller and wearing full leg compression while I slept helped push the pooled blood back toward my ticker. I wasn’t perfect, but I was better. Save for breakfast at the hotel dining area, I spent practically the entire day in my room, running through the same hot compress-foot roller-foam roller routine, napping a bit in between, then starting over. Of course there were the text messages, Face Time, Instagram, and Facebook to keep me company. Two Facebook posts by the race director indicating my position as the race leader at the end of the second day put some pressure on me, though I chose not to think about it. I was exceedingly concerned about whether I would even finish the run. And as I continued to apply more hot compresses and skim my arch over the foot roller, I felt the blisters shrink to a manageable size, while the vise that gripped the sides of my foot seemed to ease. Lunch was barbeque chicken again, with mandarin oranges for dessert, and a mid-afternoon snack of cup noodles. By late afternoon, my feet, which were my biggest concern, were not as sore. My confidence began to grow as I prepared my race must-haves and laid out my (tadah!) outfit of the day. Dinner was barbeque pork for a change, and I kept it light, knowing I would be eating constantly during the run, as evening runs, without fail, always bring out hunger pangs more often than daytime runs. ‘Bobby, where are you?’ read the text message from the race director (RD). My support and I were still en route to the start area, which was about 5 km away. Jolted by mild panic, I texted back ‘Isn’t gun start at nine yet, sir?’ hoping that I heard correctly the previous days. Turns out there was a footnote to the scheduled gun start: If all participants are assembled earlier, the race can begin before the pre-announced time. Profuse with apologies toward the RD and my co-participants, I took my place among The Magnificent Seven in a semi-circle huddled around the RD as he gave us final tips and directions on navigating the third and final run. Oh, and he announced as well that I had an eleven minute lead going into this last leg. Mantra for the moment: I will not be pressured. 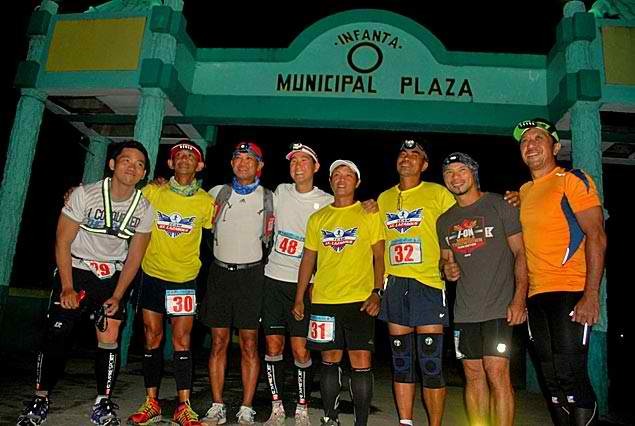 Minutes before nine o’clock, Edwin, Bong, Ruben V, Carlito, Merwin, Ruben H, and I set out into the enveloping darkness of a nippy Sunday evening, eager to notch this last leg with composure and add a new chapter to our respective endurance race histories. Edwin, Bong, and Ruben V took off faster than you could say ‘Alaminos’ and were not to be seen or heard of until much later. I ‘middled’ it and stayed with my run-walk interval plan, aiming to allay my plantar woes the best I could. The beginning of my run went smoothly, until I got to my third interval, where the road started to climb towards the ebony evening sky. The hurt was back, and there was no denying it would be there for the rest of the fifty or so clicks left to cover. I thought it best to try to ignore the pain and take advantage of the cool weather. You’re going to be surprised at your pace on the last leg. Jonel, he of the ‘no frills, all thrills’ ultra road and trail races, texted me that prophetic message earlier that day. As I shuffled my way up the dark, desolate road, I secretly hoped that the surprise would be a positive one; that we would all somehow run faster than the previous days even on tired legs and worn-out bodies. I can’t quite explain what really happened as I crossed somewhere between Km 20 and 21. Second wind. Being in the zone. Total focus. Perhaps I wanted to finish with aplomb, or maybe my body just finally said “F—k it, if we’re going to finish, we’re going to finish strong.” Whatever it was, the plantar fasciitis that was dogging me since the previous day turned from painful to numb, enabling me to clock my fastest pace — and uphill at that. I’d never seen the course before, and running uphill at night can somehow take the edge off because of two basic factors: one, the cooler ambient temperature, and two, the perceived (or unperceived) degree of the incline. As far as the latter was concerned, I later described the gradient and running up it to my cycling teammates as akin to our bike rides up Amadeo, the Cavite municipality just before Tagaytay city, which features a series of long gradual climbs interspersed with short, rolling hills — except that you did this on foot. Jilbert and Rey were surprised that I wasn’t stopping as often for hydration and nutrition as the previous days, despite the inclined course; so I told them that the cooperative weather had a lot to do with it. And it did. Aside from the cool temperature, the heavens were filled with stars and littered with wisps of clouds, inspiring enough to make me break into song. Okay, so I sang Don McClean’s ‘Vincent’ in its entirety at the top of my lungs — but if a tree falls in the forest with no one to hear it, does it make a sound? Apart from the hostile dogs that seemed to work in packs, calling out to the next group ahead as if to say ‘He’s coming your way. Get him!’ the only other unfriendly critters we met along the course were a couple of drunkards packing wooden clubs (dos for dos, in the vernacular) who had threatened to use Bong for hitting practice. 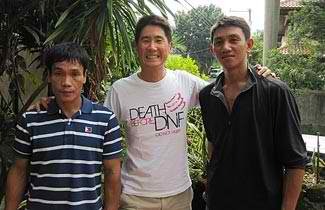 As Rey (Muay Thai practitioner) and Jilbert (trained in hand-to-hand combat) alighted from our support vehicle, Wino No. 1 hastily retreated into the darkness while Wino No. 2 sat meek and unarmed on the side rails. Bong was relieved that the cavalry had arrived, since he had been held up for some time in that spot, unable to pass. Bong and I ran and walked side by side for about three intervals before he excused himself and continued running, quietly disappearing into the night as I continued to walk whenever my watch signaled it was time to recover. As I reached Km 50, I couldn’t help but look back at the events of the previous days, and how contrasting my thoughts and feelings were at the end of each race day. I had roughly eight more kilometers to go (since the earlier stages featured distances over the declared 70 km/day), and I knew this race was in the bag. I was talking to myself and humming songs, excitedly telling Jilbert and Rey at each hydration stop that the finish line was close and that we could all finally eat a decent meal. This was my best day. I wish I had the pictures to prove it, because I was practically smiling throughout the run. I was grateful for the opportunity to race such an incredible distance, thankful for having decided to join the race, and thoroughly satisfied at the way things had turned out, difficulties and all. The thing about these types of races is that even before you’ve reached the finish line, you’re already thinking about the next race (you want to do). I remember dismissing any possibility of doing races with distances exceeding this one. But that was just before I started the WC 200. It’s a totally different story now. Sometimes, all you need is a leap of faith — and once you take it, there’ll be less than 200 kilometers left to cover. 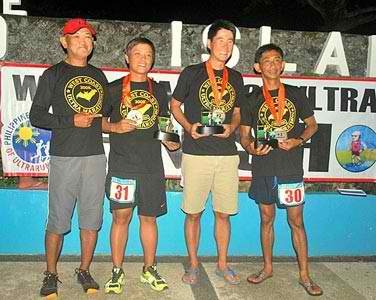 Please send me infos on how i can get through the registration for Tagaytay to Nasugbu (T2N) 50k run on December 8, 2013. Thank you very much. please deposit the amount of P2,000 at Bank of the Philippine Islands (BPI) Savings Account #0296-0673-22 and send a photocopy of the deposit slip to jovie75@hotmail.com. please bring the deposit slip at the starting area on race day for you to redeem your race packet. thanks! Congratulations to all of you guys. I salute all of you finishers. Where is the starting area and the time the run would start? Thank you again. I was hoping to receive your bank account name before the bank closes this afternoon but there was none..Im already running out of time now but Im still taking my chances for an on-site registration, pls do advice, thank you.